Anaconda is an open-source package manager, environment manager, and distribution of the Python and R programming languages. It is designed for data science and machine learning workflows, commonly used for large-scale data processing, scientific computing, and predictive analytics. 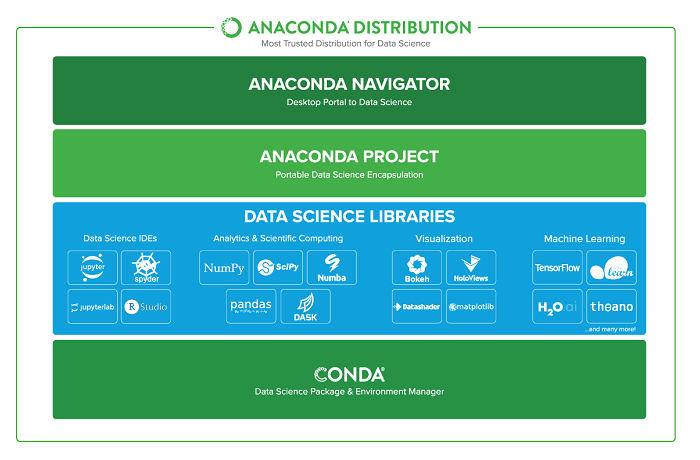 Anaconda is available in both free and paid enterprise versions. The Anaconda distribution ships with the conda command-line utility. In this guide you'll learn how to install Python 3 version of Anaconda on an Ubuntu 18.04 server. Before you begin with this tutorial, you should have a non-root user with sudo privileges set up on your Ubuntu 18.04 server. If you have not done yet, you can achieve this prerequisite by following our Ubuntu 18.04 basic server setup guide. The best way to install Anaconda is to download the latest Anaconda installer bash script, verify it, and then run it. Find the latest version of Anaconda for Python 3 at the Anaconda Downloads page. At the time of writing, the latest version is 5.1, but you should use a later stable version if it is available. Next, change to the /tmp directory on your server. This is a good directory to download ephemeral items, like the Anaconda bash script, which we won't need after running it. You should check the output against the hashes available at the Anaconda with Python 3 on 64-bit Linux page for your appropriate Anaconda version. As long as your output matches the hash displayed in the sha2561 row, you’re good to go. As long as you agree, type yes. At this point, you’ll be prompted to choose the location of the installation. You can press ENTER to accept the default location, or specify a different location to modify it. The installation process will continue. Note that it may take some time. Finally, you’ll receive the following prompt regarding whether or not you would like to download Visual Studio Code (or VSCode), a free and open-source editor for code developed by Microsoft that can run on Linux. At this point, you can decide whether or not to download the editor now by typing yes or no. Now that Anaconda is installed, we can go on to setting up Anaconda environments. Anaconda virtual environments allow you to keep projects organized by Python versions and packages needed. For each Anaconda environment you set up, you can specify which version of Python to use and can keep all of your related programming files together within that directory. You’ll receive output with the different versions of Python that you can target, including both Python 3 and Python 2 versions. Since we are using the Anaconda with Python 3 in this tutorial, you will have access only to the Python 3 versions of packages. Let’s create an environment using the most recent version of Python 3. We can achieve this by assigning version 3 to the python argument. We’ll call the environment my_env, but you’ll likely want to use a more descriptive name for your environment especially if you are using environments to access more than one version of Python. We’ll receive output with information about what is downloaded and which packages will be installed, and then be prompted to proceed with y or n. As long as you agree, type y. The conda utility will now fetch the packages for the environment and let you know when it’s complete. Note that you can replace the word source with . to achieve the same results. If you would like to target a more specific version of Python, you can pass that to the python argument, as in python=3.3.2. The asterisk indicates the current active environment. Now, when you type the conda info --envs command, the environment that you removed will no longer be listed. You should regularly ensure that Anaconda is up-to-date so that you are working with all the latest package releases. When prompted to do so, type y to proceed with the update. Again when prompted to do so, type y to proceed. This will ensure that you are using the latest releases of conda and Anaconda. If you are no longer using Anaconda and find that you need to uninstall it, you should start with the anaconda-clean module, which will remove configuration files for when you uninstall Anaconda. Type y when prompted to do so. When you’re done editing the file, type CTRL + X to exit and y to save changes. Anaconda is now removed from your server. This tutorial walked you through the installation of Anaconda, working with the conda command-line utility, setting up environments, updating Anaconda, and deleting Anaconda if you no longer need it.